An assortment of three fragranced soaps selected from the Aromas Artesanales de Antigua floral collection presented in a beautiful gift set. Lily of the Valley, Orange Blossom, Rose Petal, Lavender, Lilac Blossom, White Jasmine and Lotus Flower. 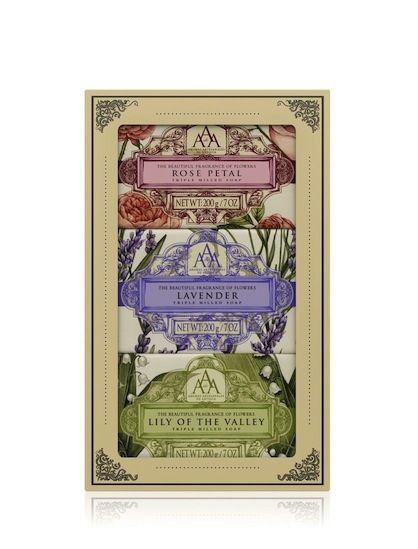 An assortment of three fragranced soaps selected from the Aromas Artesanales de Antigua floral collection presented in a beautiful soap gift set. Inspired by the scents of Antigua, Guatemala, this triple-milled soap selection provides a soap bar that is long-lasting and wonderfully scented. Triple milling creates a harder soap, so that your bar won’t fall apart easily and it will keep its shape much longer than most other soaps. It also helps the fragrance to be evenly spread throughout the soap, meaning you can enjoy the scent right until the very end of the bar. 3 x 200 g / 7 oz. Are you in the United States of America? Visit our US online store to keep shopping.